Posted June 12, 2018 by Avery & Meadows & filed under Oral Health, TMJ Treatment. Even though migraines are often be referred to as headaches, or headaches referred to as migraines, there is a difference between the two. 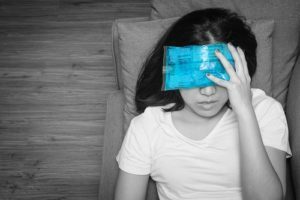 Although both share the common symptom of an uncomfortable, painful sensation in the head, there are several things to look for that can help differentiate the two. Although there is no one, absolute cause of migraines, studies have shown a connection between a poor bite and chronic migraines. How is this possible? When we look at the anatomy of the head as a whole, we can see that there is a complex weave of muscles between the head and the jaw. So when the top jaw doesn’t align well with the bottom jaw, too much pressure is put on the muscles in that area and they can become strained. When this happens, the pain may not necessarily be felt in the jaw itself (although it can be), but rather in the head as a migraine. If you clench or grind your teeth often your jaw muscles will again be put under abnormal pressure and, you guessed, you can get a migraine. Many migraine sufferers have found relief through dental intervention. To see if that may be an option for you, start by scheduling an appointment at our dental office in Memphis. This appointment will allow us to check for any signs or a poor bite or bruxism to determine if this may be the cause of your migraines. From there, we will discuss your treatment options and recommend the best solution for you. Don’t keep suffering from migraine pain, give us a call today.